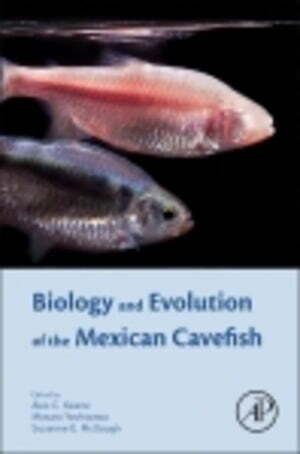 Collins Booksellers - Biology and Evolution of the Mexican Cavefish by Keene, Alex, 9780128023655. Buy this book online. Biology and Evolution of the Mexican Cavefish features contributions by leading researchers in a comprehensive, unique work that examines a number of distinct areas of biology-evolution, development, ecology, and behavior-using the Mexican cavefish as a powerful model system to further understanding of basic biological processes such as eye degeneration, hearing, craniofacial development, sleep, and metabolic function. These fish are currently being used to better understand a number of issues related to human health, including age-related blindness, sleep, obesity, mood-related disorders, and aging. The recent sequencing of the cavefish genome broadens the interest of this system to groups working with diverse biological systems, and has helped researchers identify genes that regulate sleep, eye degeneration, and metabolic function. Mexican cavefish are particularly powerful for the study of biological processes because these fish evolved independently in twenty-nine caves in the Sierra de el Abra Region of Northeast Mexico. These fish have dramatic adaptations to the cave environment, and this can be used to identify genes involved in disease-related traits. This scholarly text will be of interest to researchers and students throughout diverse areas of biology and ecology. It includes photographs of animals and behavior in laboratory and natural settings that will also increase interest and accessibility to non-experts.